Anchored by the transcending experience of seeing ULURU for the first (or fiftieth) time. The ancient and achingly beautiful desert soul of the RED CENTRE. It’s 7pm and I’m sitting cross-legged among rings of spinifex, a cockatoo’s flight from the main stage – a glowing red rock that, at almost 350 metres high, is taller than the Eiffel Tower. As the sun sinks into the horizon’s blanket, the rock slides through a palette of colours. It moves from red to blood orange to pink, and from a kidney-hued purple to a final shade of black. 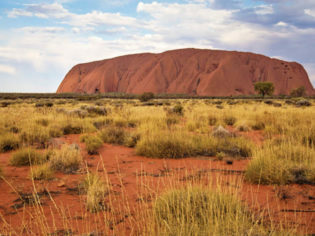 Uluru: its image dons high-gloss brochures, forms the backdrop of countless outback cinema scenes, and sits beneath a bevy of aerial camera shots captured for tourism commercials. So, given its overexposure, why is it that witnessing ‘The Rock’ in person is an altogether different experience – one that etches itself deep? Of course, the answer lies in equally deep places, and it differs for each visitor who journeys to the Red Centre. But for me, the place feels like our country’s cathedral; a pilgrimage to the heart of things. For this reason, a wave of emotion rises in my chest as I sit here in the scrub and red dirt, watching the light turn an unlikely muse – a huge hunk of rock – into something altogether magical. In addition to its sheer physical beauty – the red colour, for instance, is due to the high concentration of iron in the surrounding earth – Uluru and nearby Kata Tjuta are the traditional dreaming sites of the local Indigenous people, the Anangu. These monoliths, with their crinkles, creases, indentations and ancient drawings, provide a map of ancestors’ births, battles and deaths. With a sense of satisfaction – finally I’m doing this, after years of wanting to visit – I amble back towards my campsite and enclose myself in the tent. Camping here was a decision I made after a lot of deliberation. After all, choice is abundant: Yulara, the small village set just outside the park’s borders, boasts accommodation of all kinds – from a luxury lodge through to a backpacker’s hostel and cabins. Yet for some reason, I feel compelled to be within arm’s reach of everything: to the breeze, the birds and the curious noises of animals that ring out at night. Happily, this works for me. I sleep solidly, waking just in time for sunrise – it’s common traveller’s wisdom, I’m told, that a visit here is incomplete without seeing the rock at both sunset and sunrise. Afterwards, it’s time for the full monty: a 10.6-kilometre base walk around the Rock’s circumference. I start on the Mala Walk, alongside a park ranger guide. This two-kilometre walk delves into the rock’s Indigenous creation stories, focusing on a totem animal dear to the hearts of local people. I eventually end up at the Mutitjulu Waterhole, one of the most peaceful waterholes at the Rock. I stop, catch my breath and find a pocket of calm. That afternoon, I zip 40 kilometres across the desert park to Kata Tjuta. Its title means ‘many heads’, and here, a series of red domes run through yet another psychedelic light show, depending on the time of day. My guide had earlier told me that the most stunning path here is the 7.4-kilometre Valley of the Winds walk. I pack plenty of water and fly repellent for the journey and set off. The looping route leads me through a spilt of towering rock into a valley bedded with soft green grass. The scene is lined with low-leaning ghost gums. It feels ancient, and again, loaded with spiritual muscle. As darkness falls I pull on a dress, if just for one night. ‘Sounds of Silence’ is a group affair at Ayers Rock Resort whereby diners sit at open-air shared tables to enjoy a buffet-style meal. The experience provides uninterrupted views of Uluru itself, and after dinner, ‘star talkers’ guide us through the countless stars and constellations twinkling above our tables. Another mesmerising nighttime pursuit is Field of Light, a carpet of coloured spindles of light by artist Bruce Munro. As the evening draws to an end and the Rock sits shaded in the distance, I’m grounded. I’m full. And it’s not dinner or wine doing the talking. Instead, it’s something far harder to capture. It’s the desert, and the things – still, silent and secret – that lie in its core. Getting there Qantas and Jetstar fly into Uluru. Staying there Four night packages, including Kata Tjuta Domes tour and Field of Light Star Pass, start from $729per person twin share. Conditions apply.